This was one of those cute, funny, make you feel good reads and I wasn’t disappointed. 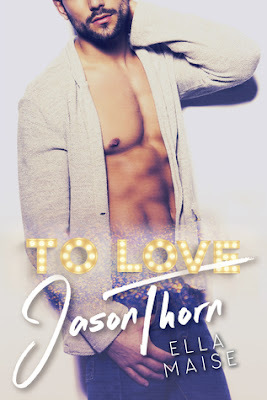 I came across To Love Jason Thorn as a result of a trawl through Amazon, it was the cover that drew me at first and then once I had read the synopsis I was all in. I love a second chance romance and even though this wasn’t second chance per se, it was definitely second chance for Olive. Olive had been in love with Jason Thorn for as long as she could remember. Jason Thorn was her brother’s best friend and they had literally grown up together. Jason referred to her as his “Little One” and was extremely protective towards his “adopted” little sister. However, for Olive it was definitely more than that. As she grew older she held onto the vague hope that he would finally see her as someone other than Dylan’s little sister but it just never happened. To try and scope out how the land lies with him Olive comes up some hair brained scheme to try and wheedle out his real feelings but it only has disaster written all over it. Then to add insult to injury, Jason is dragged across country by his father and Olive loses contact with the love of her life. Even though she hasn’t seen him in years Olive has never got over Jason Thorn, now grown up and ending her University life studying English and Creative Writing he is never far from her thoughts. But Olive’s life is about to change. It seems her love of Jason inspired her debut novel, a novel that she indie published, that took the best seller lists by storm and is now being optioned for film. Olive’s life is definitely changing for the better. Olive was a great character, she has her quirks but they make her all the more adorable. Even though she is quiet she is sassy in her own way. Jason Thorn was adorable from the beginning. He was the peace maker between Dylan and his little sister Olive. He was protective of her from the get go, she was the little sister he had never had. Being an only child and having a less than ideal family life, Olive’s family had more or less adopted him. He always had a family next door. When Jason’s father takes him away from the only family he has ever known Jason totally changes. It is too painful for Jason so he does what he thinks is best and loses all contact, better to not know than want a family he deems he cannot have. Despite everything he has lost though, LA has treated him well and he is now an in demand actor but as much as Hollywood loves him because of his acting skills, his PR leaves a lot to be desired. Jason seems to be self-destructing, jumping from meaningless one night stands, no matter when or where the need takes him, leading to paps photographing and videoing him in compromising positions. Jason needs to clean up his act if the job offers are to remain on the table. Jason and Olive cross paths once again as Jason is cast as the leading role in the film adaptation of her book. Call it fate or kismet or whatever, but what are the chances. Not knowing that he is the muse behind the book Jason is shocked to find out his “Little One” has penned the novel and now that nurture and protectiveness kicks in once again. But what Jason immediately notices is that his “Little One” has definitely grown up. What I loved the most about this book was the realness of Olive and Jason’s relationship, both as kids and when they first meet once again. It was so believable. Jason was so protective over Olive even as kids, and while he “loved” her in his way, it wasn’t the same way as Olive. The bond they had though was always there from the very beginning. I loved that this wasn’t an instalove thing either. At first Jason goes into the big brother role once again, that protect and nurture but he soon realises that Olive is stronger than he gives her credit for and when circumstances throw them together I was itching for him to actually see the real Olive before him, not the little sister he still saw her as. This book was adorable; it is low on the angst and high on the laughs. I had a smile from ear to ear for the majority of this read. It was definitely a feel good read. Their story was totally engaging and I loved how the book world and film industry were depicted throughout. This book is full of laughs, swoons and hotness and I have to applaud the author for the photoshoot scene. It was steamy, it was sensual, and it made my heart beat faster it totally consummated my love for this author’s voice. While this is a new to me author, I will definitely be checking out her other work.